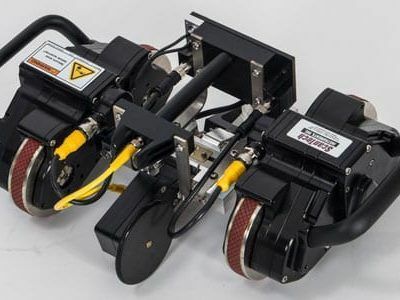 The Jireh Tripod Wall Crawler is a remotely controlled vehicle designed to move along straight or curved metal surfaces. Using three powerful magnets, the wall crawler can climb vertically or horizontally, even upside down. Cameras and other inspection equipment can also be attached, allowing for easy access in hard to reach places. Jirah’s Tripod Wall Crawler has a three wheeled computerized drive system, providing 360 degree rotation, giving you unparalleled movement and flexibility. This vehicle is composed of industrial-grade materials, providing protection against harsh production environments including vibration, shock and temperature resistances. The rugged umbilical cord houses power, communication cords, coax conductors, and even a water line. The Tripod Wall Crawler also features environmental seals which prevent contaminants from entering the unit. 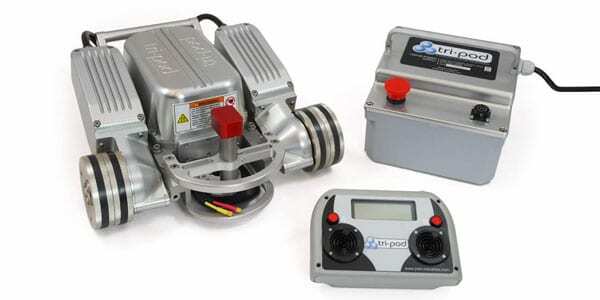 Unique Linkage System: The TriPod’s magnetic drive wheels automatically remain perpendicular to the pipe or tank surface when driving in both the longitudinal and circumferential directions. Control system: Onboard intelligence provides functionality, flexibility, and expandability. All components are industrially hardened for the best in vibration, shock, and temperature resistance. Molded umbilical: The TriPod has a rugged umbilical with power, communication, 4 coax conductors and a water line molded into a durable polyurethane jacket. Real-time encoder feedback: A sealed optical encoder is mounted on the steering wheel providing accurate straight line positioning information. 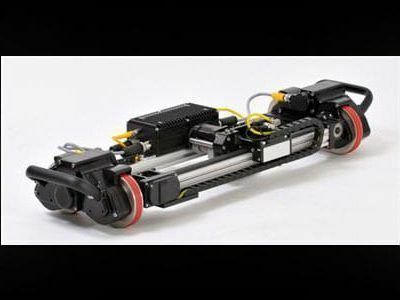 Probe lift actuator: A small lightweight linear actuator is used to lift a probe on and off of the inspection surface. The probe is mounted in a wear shoe with a virtual pivot point to allow for surface irregularities. Visual inspection camera (optional): The TriPod can be fitted with a video camera for remote visual inspection or as a driving aid. The camera feed is sent down the standard umbilical. Multi-probe holding adapter (optional): If multiple probes are required, an adapter is available to integrate standard Slip Joint or Vertical Probe Holders on the TriPod.